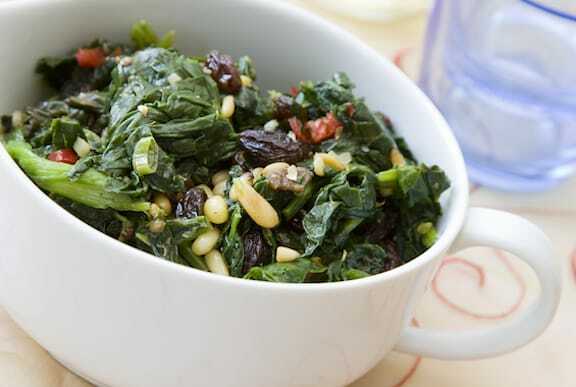 Spinach with pine nuts and raisins is a traditional Mediterranean side dish that’s both elegant and easy. Its mild and slightly sweet flavor provides a nice counterpoint to boldly flavored Italian pasta dishes. But really, it goes well with most any kind of meal, including those featuring grain dishes and curries as well. Heat the oil in a soup pot or steep-sided stir-fry pan. Add the garlic and pine nuts and sauté over low heat, stirring often, until both are golden, about 3 minutes. Add the spinach and cover. After 1 minute, uncover and stir in the scallions, then cover and cook just for another minute or two, until the spinach is just wilted but still bright green. Remove from the heat. Stir in the lemon juice, raisins, and optional dried tomatoes. Season to taste with salt and pepper. Drizzle in a little more olive oil if you’d like, and serve at once. 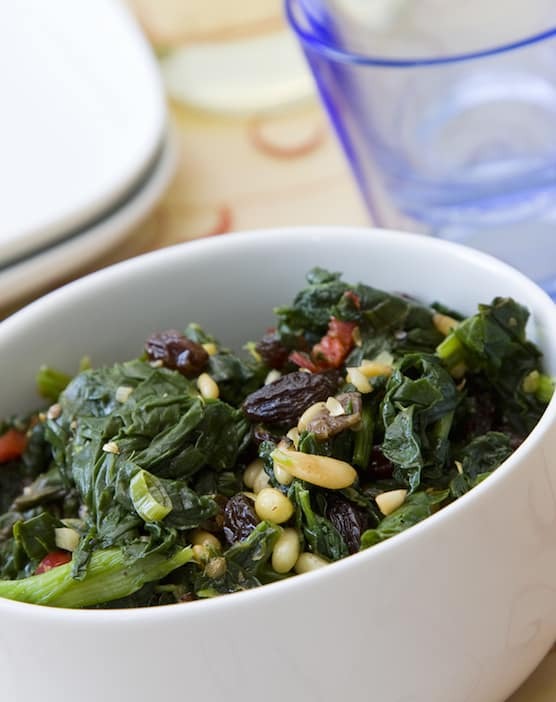 See more of VegKitchen’s Mediterranean Diet recipes.